At the end of last week, Mets ace Jacob deGrom set an ultimatum. Either the Mets extend his contract before opening day, or talks are off. To put pressure on the front office, deGrom threw out the idea of an innings limit. This situation has triggered off a debate among fans and pundits alike. Should the Mets extend a contract or let him walk? While the popular opinion seems to say that the Mets should lock him up, I believe the Mets should not. Jacob deGrom took a strange path to greatness. 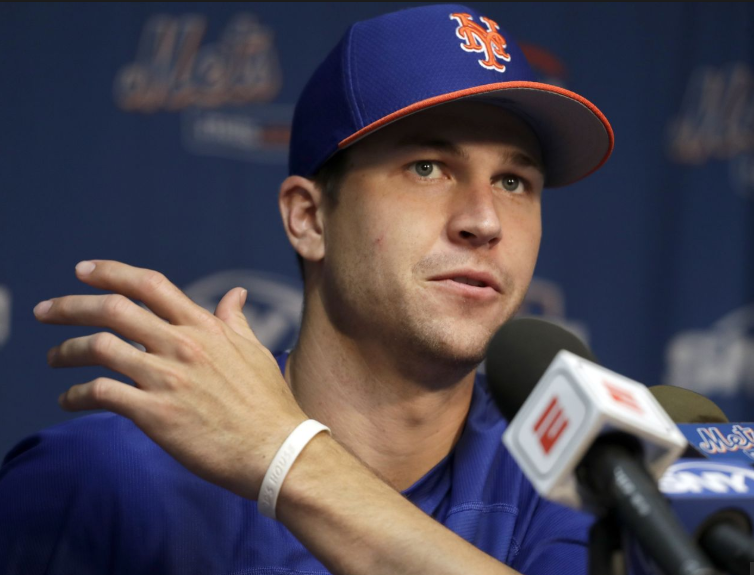 He was not drafted out of high school and in 2010, the Mets selected him in the ninth round. While he pitched in college, he was also a shortstop and it wasn’t clear on draft day what position he would play. The Mets sent the 22-year-old deGrom to rookie ball, but it didn’t last long. After six starts he was shut down, needed Tommy John surgery and missed all of 2011. By the time he returned to action in 2012 he was 24 and not projecting to reach the majors. However, he had a very strong year and by 2013, he reached AAA. After a great start to 2014, the Mets called up the now 26-year-old Jacob deGrom. In other words, he was far from being called a ‘can’t miss prospect’. Once in the majors, Jake deGrominated. He overmatched batters and took home the NL Rookie of the year award with ease. The following season he made his first all star game and pitched well in the playoffs. In 2016 and 2017 deGrom was a very good pitcher but 2018 saw him become the best pitcher in baseball. Last season he led the majors in ERA, FIP and was at the top of nearly every pitching category. He breezed through batters with such ease it was otherworldly. He barely made any bad pitches all season. The 2015 all star game was the moment many realized just how good deGrom was. 2019 is his age 31 season and the Mets have one more of team control. That means that deGrom will only become a free agent right before he turns 33. He will not be a youngster anymore. Does it make sense to lock up a starter in his mid-30’s? This is debatable, but as a rule there are very few great pitchers who are 33 or older. Max Scherzer and Justin Verlander are both great. Corey Kluber will be 33 this season so he could join that club. However, there is a long list of solid but not great pitchers like Zach Greinke, Cole Hamels and Jon Lester. All are getting paid for success before they hit 33. However, the aging curve shows that most pitchers lose velocity as they enter their 30’s. The Boston Globe researched this in 2015 and the graph below shows the WAR of both pitchers and position players drops sharply after age 28. This graph shows the percentage of players with a WAR that is 2.0 or higher by age over the course of 30 years. Jacob deGrom was the best pitcher in baseball in 2018 at age 30. This is a fact that is hard to argue. However, it is highly unlikely that he can keep up this pace. Perhaps he can have a comparable season one or two more times, but the odds of deGrom being this good at age 33 are slim. Again, Verlander and Scherzer are exceptions, but most pitchers simply decline. Looking back over the last 8 seasons, no pitcher who was at least 33 got that big of a contract. Since 2012, 76 starting pitchers (and counting) have signed a major league contract when they were at least 33 years old. Only 6 pitchers got at least three years. Only 13 averaged at least $10 million per season. There is no reason to think that the Mets can’t get a better deal to keep deGrom once he is at least 33. After 2020, the Mets could very well keep deGrom on a much more team friendly contract. Currently his value is at the highest it will ever be. Like it or not, the Mets do not have the budget of big market teams. They are not the Yankees, Dodgers or Red Sox, who can all make up for their past free agency mistakes. The fans need to acknowledge this. The Mets still owe Yoenis Cespedes $29.5 million for this season and next. Robinson Cano is owed $100 million for the next 5 seasons. The Mets need to be careful when handing out huge contracts. The Mets can get the maximum out of deGrom and let him walk before he declines. Every team makes this mistake. A player has several great seasons and gets a big payday. The problem is that he is not projected to continue his past performance. As a result, he is being paid for how good he once was. There are too many examples to count. Ryan Howard, Chris Davis, Jordan Zimmermann, Barry Zito, Matt Cain, Cespedes and Carl Crawford all took big paychecks and underperformed. The Mets do not need to risk this with deGrom. A compromise can be made. The Mets will likely be paying deGrom between $20-25 million for 2020. I am open to extending deGrom an offer that would add another two more years and somewhere in the $20-23 million a year range for the 2021-2022 seasons. However, if anyone thinks that the Mets should lock deGrom up for a long contract until he is well past 35, they are making a grave error. It is better to let a player walk a year early than a year late. Let’s not forget that the Mets can also extend a qualifying offer after the 2020 season and get compensation draft picks and international pool money if he walks. While we all love deGrom, the Mets do not need to pay him now. The team has two more seasons of control before making a better decision.